The Agriturismo Podere Campalto is made up of 5 apartments in an old, rural country house, wisely restored and situated in 400 square metres of natural garden. Each comfortable apartment has air conditioning, satellite TV, use of the laundry and covered parking area. In the large garden our guests can. relax in the shade of the large pine trees, sunbathe on our `solarium' with a splendid sea view and dedicate themselves to cooking with the barbeque or pizza oven. The Agriturismo Podere Campalto, immersed in the countryside and in contact with nature is the ideal base for walks in the open air. 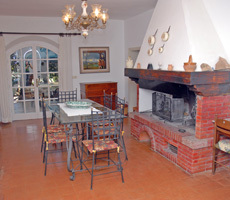 Only 5 minutes away from the beaches of Rimigliano and Baratti and the hot waters of the thermal lake ' Calidario '. 3 room apartments with: 2 bedrooms, living room with sofa bed, cooking area, bathroom, shared garden with table and chairs where you an eat outside.